Welcome to the Moulin d’Onclaire in Coux, medieval village near Privas. Le Moulin d’Onclaire, overlooking the village, near a river opens to the beginnings of the Ardeche. Le Moulin d’Onclaire mill is based on the site of an old flour mill and throwing (silk mill) has retained its original buildings: A beautiful building of the seventeenth century. It offers a warm welcome calm in a shaded park for family holidays combining pleasure, relaxation and emotions. The medieval village of Coux is located along the Ouvèze valley on the D104, 17km from the A7 motorway and 3 km from Privas, the capital of the Ardeche. 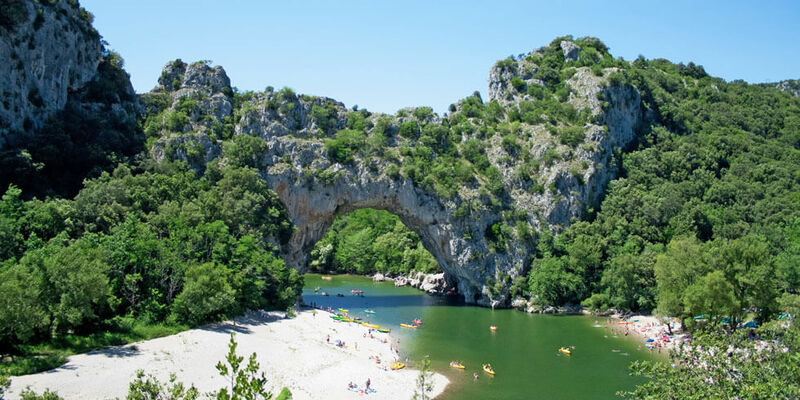 The Ardèche, between the green of its many forests and gray basalt plateaus, is a land of contrasts forged by geological accidents that have resulted in impressive landscapes: caves, sinkholes, gorges, waterfalls and the famous Bridge ‘Bow ! This extraordinary cave as Lascaux was remodeled identical to welcome visitors from around the world. Site World Heritage of Unesco, the Chauvet cave awaits you only 1 hour of Onclaire camping. In a few tens of kilometers, you will discover the great variety of natural landscapes, which extend over a cliff over a thousand meters of altitude. Scrubland to the steep slopes of the Cevennes, the vast plateaus to the plains of Valencia, midway between Lyon and Marseille, between the Rhône Valley and the Ardèche Gorges, every view will offer extraodinary panoramas. Lazing on rocks near a stream, swimming and sunbathing guaranteed! Camping Le Moulin d’Onclaire at Coux village located in the center of the Ardeche, about 1 hour from Vallon Pont d’Arc, Ruoms in southern Ardeche, purpose rental of mobile homes, cottages and campsites for your holidays. You can discover or enjoy the region of Ardèche, rich in exceptional sites: picturesque villages, prehistoric sites, Vallon Pont d’Arc, valley of Eyrieux, area ideal for canyoning, water sports, mountain biking, tree climbing, climbing, karting and much more!